As midstream activity quickens in North America, customers prefer providers with strong operating and project development skills. Findings from EnergyPoint Research’s latest customer satisfaction survey suggest a handful of companies are solving these problems most effectively. 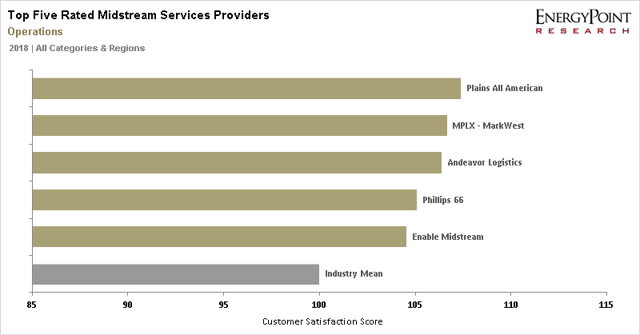 MPLX, Enable, Plains All American and Crestwood lead the pack. Investors are noticing, with unit prices of top-rated companies handily outperforming peers. It pays to keep customers smiling ― even in the midstream. Midstream companies have always had to offer competitive pricing and terms. As midstream activity quickens in North America, customers are maintaining preferences for providers with strong operating and project development skills. Fair-minded service also matters. Solutions are in high demand. Pipeline constraints in West Texas ― ground zero of U.S. shale oil production ― are crimping output. Prolific amounts of natural gas in the Appalachia Basin seeks more ways out. Petrochemical and LNG facilities on the Gulf Coast demand feedstock. And Canadian producers beg for access to markets. Findings from EnergyPoint Research’s latest customer satisfaction survey suggest a handful of companies are solving these problems most effectively. Leading the pack is MPLX-MarkWest Energy (NYSE:MPLX), which operates in several U.S. regions. The company rated first in the survey, ranking highest in total satisfaction, onshore gas gathering, HSE practices, Permian Basin and Texas Intrastate. Enable Midstream (ENBL) was the survey’s runner-up, ranking first in gas storage and in the Ark-La-Tex region. Plains All American (PAA) rated first in operations, onshore crude gathering, NGL transportation and storage, project development and the Onshore Gulf Coast. It took the third spot overall. Rounding out the top five were Andeavor Logistics (NYSE:ANDX) and Crestwood Equity (CEQP). 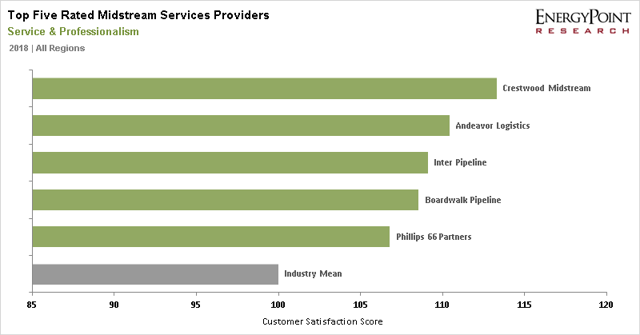 The survey reflects findings from more than 3,200 evaluations by qualified respondents at companies utilizing midstream services. A total of 28 U.S. and Canadian midstream companies were included in the survey’s final results. It’s no accident top-rated companies are involved in some of the most anticipated projects in the sector. Take West Texas, where oil traded at a crippling $15 discount to WTI earlier this year. Plains All American was one of the first to offer a solution, expanding capacity of its Sunrise Pipeline from West Texas to Cushing by more than 300,000 barrels per day. Not only was the expansion larger than projected, it came online sooner than forecast. Being first-to-market and exceeding expectations boosts revenues and reputation. Meanwhile, MPLX-MarkWest is playing an active role in the Northeast. The company — which merged with number-four ranked Andeavor in October — is adding processing and fractionation capacity to serve Marcellus and Utica customers. The projects boost throughput and enhance netback. Customers have clearly noticed. Investors are noticing as well. Unit prices of each of the top-five rated companies have handily outperformed the Alerian MLP Index (AMLP). Year-to-date, the companies have delivered an average return of +13.5% (Crestwood leads with a gain of 28.7%). The AMLP is down 9.1% over the same period. This isn't the first study to suggest satisfied customers are good for financial performance — just the latest. 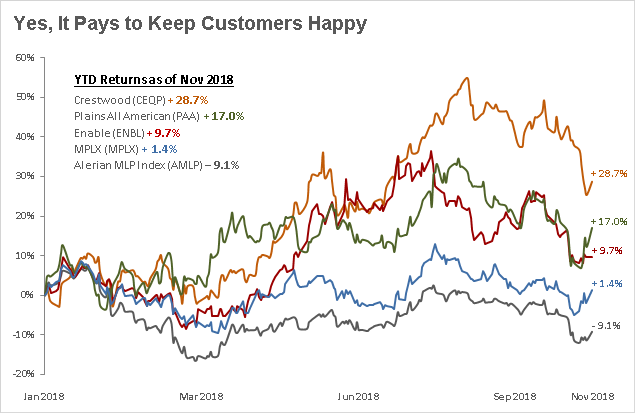 In EnergyPoint and others' surveys, the tie between customer ratings and shareholder returns is well documented. The reasons are simple. 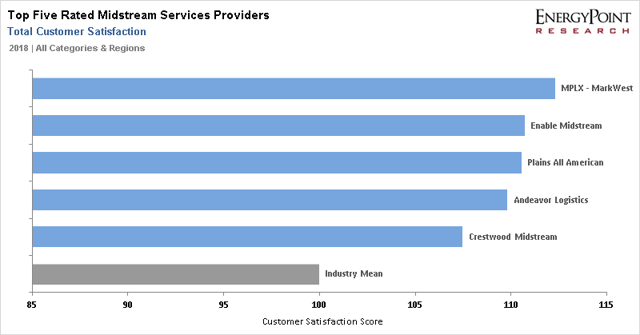 Customers prefer to work with providers that consistently meet their needs and exceed their expectations. In competitive deals, favored suppliers get the last look. They also win the ties. The result is higher margins, stronger cash flows, and greater visibility to the business. Everybody wins — customers, midstream companies and investors. — Archrock (AROC) in gas compression services and the U.S. Rockies & San Juan Basin. Disclaimer: My firm, EnergyPoint Research, does and/or seeks to provide for-fee data subscriptions to oil and gas industry participants, investors and other stakeholders, including companies covered in its posts, reports, articles and surveys.